The eight day Jewish holy day Hanukkah is the time that Jews around the world mark the rededication of the second temple in Jerusalem after the Greek leader Antiochus Epiphanes had desecrated the temple by slaughtering a pig on the temple alter. Over a three year period of time, the Jews grew strong enough to overthrow the Greek leader and the Maccabees ran Antiochus out of Israel and cleansed the temple and restored temple worship and practices. In fact, the flask of virgin olive oil they used to relight the seven branched candelabra, the Menorah, stayed lighted for eight days - thus the Jewish holy days of Hanukkah. The Jewish holy days of Hanukkah remind us of an event that will be repeated in the future - according to Bible prophecy. 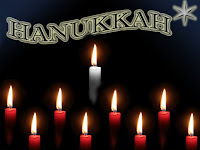 Jewish people around the world for the eight days of Hanukkah will light a candle each day to mark the overthrow of Antiochus Epiphanes and the reconsecrating of the Jewish temple in Jerusalem over two thousand years ago. The Maccabees rose up against the Greek leader Antiochus and after three years were able to return to temple worship and practice on Kislov 25, the Jewish month of December. Interestingly, the early church fathers selected December 25 to celebrate Christmas based upon the fact of the feast of dedication taking place on December 25, 165 B.C. Antiochus Epiphanes had slaughtered a pig on the temple alter and stopped Jewish worship in what was referred to as the Abomination of Desolation. This event in history is a prototype of things to come, according to God's Word found in the prophetic book of Daniel. In fact, Daniel, the ancient Jewish prophet, 360 years before the fact foretold the act by Antiochus (Daniel 11:21-35). Daniel also prewrote history about the Abomination of Desolation that will take place at the midway point of the Tribulation Period in the future (Daniel 9:27). There will be a temple in Jerusalem desecrated once again, a temple that the Jewish people are right now prepared to build. History will be repeated - Bible prophecy will be fulfilled.